The biologists studied the mitochondrial DNA of the animals, which is abundant in ancient remains. (Mitochondria are tiny sub-cellular structures with their own small genome.) By comparing this ancient mitochondrial DNA with the modern mitochondrial genomes of 77 domestic dogs, 49 wolves and four coyotes, the researchers determined that the domestic dogs were genetically grouped with ancient wolves or dogs from Europe—not with wolves found anywhere else in the world or even with modern European wolves. Dogs, they concluded, derived from ancient wolves that inhabited Europe and are now extinct. Wayne said that that the domestication of predatory wolves likely occurred among ancient hunter–gatherer groups rather than as part of humans' development of sedentary, agricultural-based communities. "The wolf is the first domesticated species and the only large carnivore humans ever domesticated," Wayne said. "This always seemed odd to me. Other wild species were domesticated in association with the development of agriculture and then needed to exist in close proximity to humans. This would be a difficult position for a large, aggressive predator. But if domestication occurred in association with hunter–gatherers, one can imagine wolves first taking advantage of the carcasses that humans left behind—a natural role for any large carnivore—and then over time moving more closely into the human niche through a co-evolutionary process." "We know also that there were distinct wolf populations existing ten of thousands of years ago," Wayne added. "One such wolf, which we call the megafaunal wolf, preyed on large game such as horses, bison and perhaps very young mammoths. Isotope data show that they ate these species, and the dog may have been derived from a wolf similar to these ancient wolves in the late Pleistocene of Europe." "When we previously found some similarity between Middle Eastern wolves and domestic dogs, that similarity, we are now able to show, likely was the result of interbreeding between dog and wolves during dog history. It does not necessarily suggest an origin in the Middle East," Wayne said. "This alternative hypothesis, in retrospect, is one that we should have considered more closely. As hunter–gatherers moved around the globe, their dogs trailing behind probably interbred with wolves." Wayne considers the new genetic data "persuasive" but said they need to be confirmed with an analysis of genetic sequences from the nucleus of the cell (roughly 2 billion base pairs)—a significantly larger sample than that found in mitochondrial DNA (approximately 20,000 base pairs). This is challenging because the nuclear DNA of ancient remains tends to become degraded. 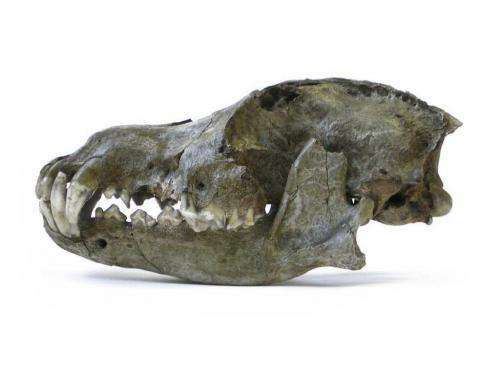 More information: "Complete Mitochondrial Genomes of Ancient Canids Suggest a European Origin of Domestic Dogs," by	O. Thalmann et al. Science, 2013. When they say dogs are the only large predatory animal that has been domesticated. I was just wondering, what about cats? Or am I missing something there? @Zera - The authors don't consider the house-cat to be large (wolves are roughly the same size as humans, while cats are roughly 10x smaller). 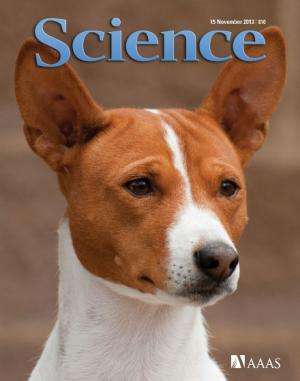 As an aside note to the article in question....I find it interesting that the third article down on the 'related stories' section is titled "Genetic study confirms: First dogs came from East Asia". I've recently read that some DNA evidence suggests that dogs started to deviate as long as 100,000 years ago and that all domestic dog breeds came only from the Grey Wolf. So there is evidence that at least some dog/human association goes back that far. True Domestication happened later and I would agree with the higher estimate in this story that it started to occur more like 32,000 years ago. The study I saw also suggested that dogs could be the single most important factor in the founding of our civilization. The East Asia origin and 32K time frame fits with the nutrient-dependent adaptive evolution of a population in what is now central China; with the fossil record that suggests one species of Homo during the past 1.8 million years; with climate change that favored the change in diet that precipitated the morphogenesis from Neandertal body type to the "modern human" body type; and the dietary change to starches that correlates with wolf to dog domestication via differences in exploratory behavior in post-natal weeks 3-4 in wolves but after 6 weeks in dogs. Obviously, however, all these things are linked by coincidence, since they do not fit the current views on mutation-initiated natural selection and species divergence. "Pheromone" troll is trolling "nutrients" now. Whatever floats his woo food site. @Zera: Domesticated cats clades within "small" cats, while there was an interesting line to modern "large cats" with lions et cetera on one branch and lynx et cetera on another. Apparently the split to our large cats isn't well placed, because there were new findings pushing it back from say 2 million to say 3-5 million years. Another problem for DNA sequencing to solve perhaps. It's also interesting how any domesticated species can return to the wild after a few generations, given the opportunity. Dogs tend to be faithful, loving companions. We've owned both, but I don't think cats offer the same level of friendship or companionship that a dog provides. This also makes perfect sense and falls in line with the fact that cats were domesticated much later. They are NOT as cued in to human emotional responses, body language, and even verbal language as dogs are. Wolves are more intelligent and much better at problem solving than dogs are, but Dogs are FAR more socially intelligent and rely on human cooperation to solve their problems because they've been selected for that. I am reluctant to believe you remember reading anything on physorg 50000 years ago. I am sure the internet didn't exist then, but new dating techniques such as token ring counting may prove me wrong. Ken Ham would surely have to ask, "Where you there?" Thanks guys, helped clarify the relationship, I thought that it was similar to dogs with the whole, large animal, breed for successful symbiotic relationship the traits you want.